2) Save boatloads of cash when you stop buying designer fragrances. What can perfume be made from? This chapter focuses on some of the unique ingredients involved in making perfume...can you guess which kind of alcohol we recommend? What kind of supplies will be needed, and where can you get them? You might be surprised to find out just how accessible the supplies really are. Not nearly as extravagent and posh as you might imagine! What is the link between perfumes and aromatherapy? Not only can you smell great, you can also FEEL great with the right perfume. It's all explained, including some easy to follow instructions for recipes that beginners can try out. 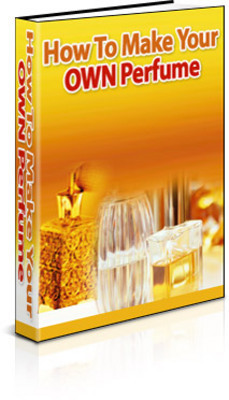 How To Make Your Own Perfume only $1.49! How To Make Your Own Perfume - With Plr + 2 Mystery Bonuses!